1. Survey your audience. Ask questions about demographics, psychographics, and online behavior so you can better understand where to market to readers and what messaging they’ll respond to. Survey your existing audience and fans of comparable authors and books. 2. Conduct reader interviews. Try to understand how your readers find new books to read and make their purchasing decisions. This will add qualitative color that can help you understand quantitative data you analyze in spreadsheets. 3. Create reader personas. Write a short paragraph that describes each core group of readers you’re targeting. 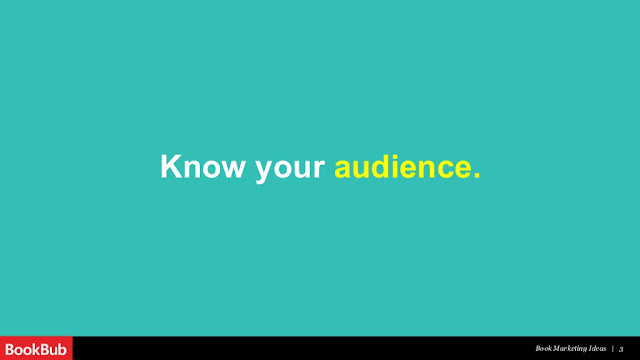 Refer back to it whenever you’re creating an ad, designing a cover, writing a tweet, or want a refresh on your audience’s motives. 4. Create a list of target keywords. Compile a list of of search queries that your target audience is using to search for books. Use tools like Google Trends and Google AdWords’ Keyword tool to see which relevant queries are frequently used.